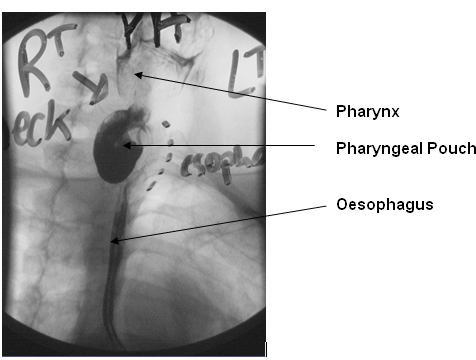 A pharyngeal pouch is an out-pouching of the pharynx at the level of the junction between the pharynx and oesophagus. It occurs in older people and is actually a hernia between muscles at the junction on the pharynx and oesophagus caused by the lower muscle being in spasm. Symptoms include difficulty swallowing with food sticking, regurgitation of undigested food after eating and gurgling noises when swallowing. Surgical resection of the pouch is the only definitive treatment in association with division of the muscle which is in spasm and is the underlying cause of the problem. This resection is most readily accomplished by an incision in the Left neck. A naso-gastric pack makes the oesophagus easier to feel in the neck. Once the muscle is divided and the sac resected, the defect is closed with dissolving stitches and the wound drained. Hospital stay is usually 1-2 days. Complications are unusual and include salivary leak, and wound infection.